We bring you a guest post by Katherine Martin and Sarah Kearney, two of the UNC students studying with us this semester. Katherine provided us with the text and photos 3, 4, and 7, while Sarah took pictures 1, 2, 5, and 6. The weekend of February 22-23 the UNC in Sevilla program took a class trip to Granada, Spain! I LOVED it!! 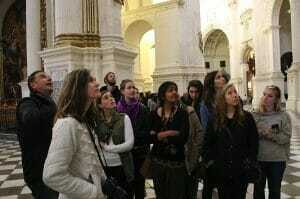 Granada is located to the east of Sevilla, about a 3-hour bus ride away. It is nestled in the Sierra Nevada mountains, and the town had a very cool and laid back vibe. The town is known for the Alhambra, a famous structure where the royalty lived. 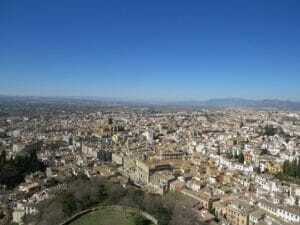 It is almost like a “city within a city” in the Alhambra. 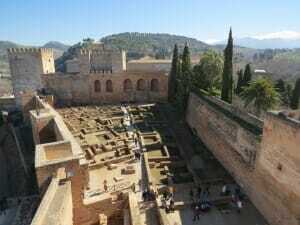 With its walled exterior and beautiful view looking down over the city of Granada, the Alhambra was definitely a neat sight to see. 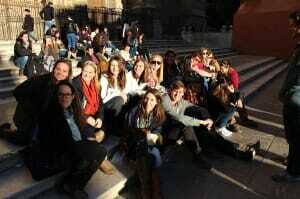 We were lucky enough to visit the Alhambra and have a guided tour in Spanish by one of our very own professors! 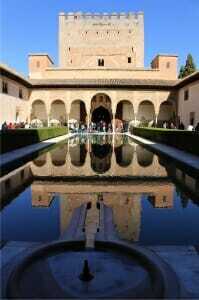 Inside the Alhambra were spectacular decorations of Muslim origin and influence. 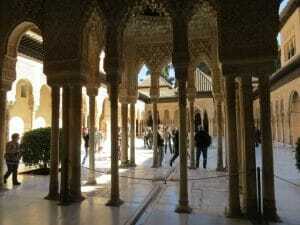 The interior of the Alhambra is filled with many fountains and small “rivers” running through it. Water symbolizes la vida and in many places there are cross formations with small rivers of water on the floors of the patios. It was so neat to be able to see these structures that we have been learning about in our classes while in Sevilla. This trip to Granada with UNC was by far one of my favorite trips. It gave us time to not only get to know each other better, but to explore another fantastic city in Spain.